A Kickstarter campaign was recently brought to my attention and since it involves a deck, you know I had to share it! I’m excited about it because it looks like it’s incredibly flexible in how you can use it, has beautiful artwork, and the accompanying book features the creator (Bernadette King), Patricia Telesco, and Dayna Winters (who has had a book or two of her own featured on our site). So, what am I talking about? 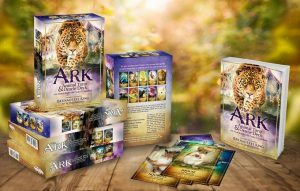 “The Ark Animal Tarot & Oracle Deck”. Bernadette King has created a 100 card multi-use animal themed tarot & oracle deck with 300+ page full-color guidebook. I just love the flexibility! You can easily use it like a traditional tarot deck (complete with major and minor arcana) or as an oracle deck, and probably a bunch of other ways! Ready for more? 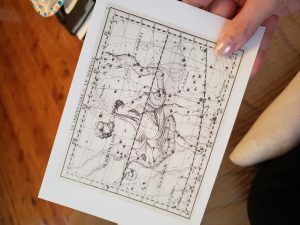 Bernadette King, the creator of the deck has offered to giveaway a deck to one of my readers! (Once the project is funded and the deck is completed, of course.) Enter today using Rafflecopter! You have until Friday April 5, 2019 11:59pm eastern to enter! As most of you are aware, I started selling merchandise a few months back. Everything I created has different phrases and sentiments that I like and thought you might enjoy. However, in the back of my mind there was something else I wanted to do too. Hiding in the public domain are many beautiful works just waiting to be rediscovered and shared. I happened across several by John Flamsteed. (By the way, if you support me on Patreon this is all old news to you.) Flamsteed (1646-1719) was an English astronomer and the first Astronomer Royal. 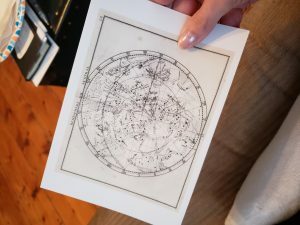 He catalogued over 3000 stars and was responsible for several of the earliest recorded sightings of the planet Uranus, which he mistook for a star. After his death his widow helped get his work published as “Atlas Coelestis”. Flamsteed’s work was updated and republished several times, the last being in 1795. Although the work he did was for science, the images he created are art. And I want to share it! That’s why I used several of his charts to make a line of greeting cards and postcards! You can see them all in my online store! You’ll want to click in on the images to see what they truly look like, CafePress treats home screen edits more like suggestions than directions. If you like what you see, don’t wait to purchase, these are only going to be available until May 31, 2019! I love reference books. Books with titles like, “Encyclopedia of….” or “Dictionary of….”. I “collect” books, but I hoard these kinds of books. For some reason I feel like I can never have too many of them, and in my defense, they all have something unique to offer. 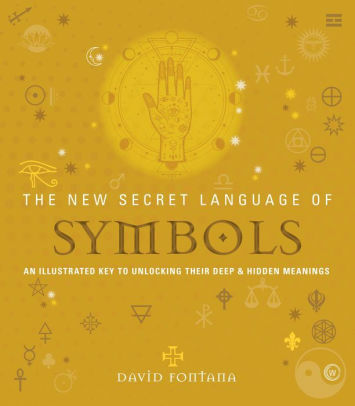 For instance, look at the two books I’m discussing today, “The New Secret Language of Symbols: An Illustrated Key to Unlocking Their Deep & Hidden Meanings” and “The New Secret Language of Dreams: The Illustrated Key to Understanding the Mysteries of the Unconscious”, both by David Fontana. The key word here is “illustrated”. Both books are entirely full color, heavy stock glossy pages filled with wonderful illustrations. These both are more than reference books, they’re coffee table art books. 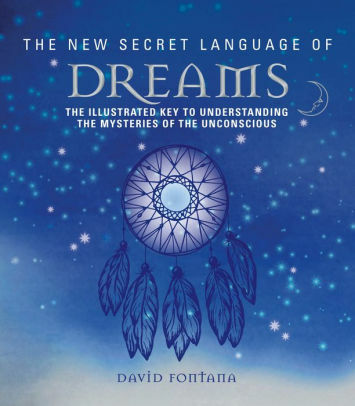 Fontana has written several books before these about dreams and meditation. He wrote “You Can Understand Your Dreams”, “1000 Dreams”, “You Can Understand Meditation”, and two different tarot decks (“The Wisdom Seeker’s Tarot” and “The Truth Seeker’s Tarot”). I guess what I’m trying to say is, these books pull on a lot of past elbow grease. I won’t claim that either of these books are revolutionary, however they are well researched, thoroughly indexed, and beautiful. I keep hearing that this strange season called spring is approaching. Flowers will be blooming and markets everywhere will be selling all kinds of arrangements for Mother’s Day. However, before you pick a flower based on its looks, wouldn’t it be cool to know what that flower represents? 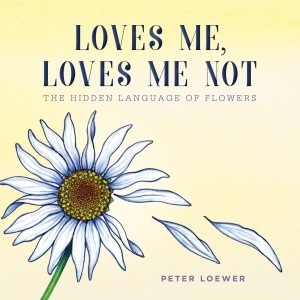 Enter “Loves Me, Loves Me Not: The Hidden Language of Flowers” by Peter Loewer. If you read my review of the “Botanical Inspirations” deck then you already know that global culture and folklore has always attributed special meanings for flowers based on their appearance or practical applications. Peter Loewer specifically takes a look at the Victorian era and their love of the language of flowers. “Loves Me, Loves Me Not” profiles 50 flowers and better yet each entry is paired with a beautiful, full color illustration by Loewer. Obviously this book is great for nature and flower lovers. Now I don’t want to tell you how to live your life, but if I was considering getting flowers for someone as a gift, I would absolutely buy this book, pick the flowers based on their meanings, and then give the flowers AND this book as a gift. But you know, you do you. “Loves Me, Loves Me Not” is a delightful and informative read that is made for sharing! Here in the northeast things are taking a definite fall-wards turn. 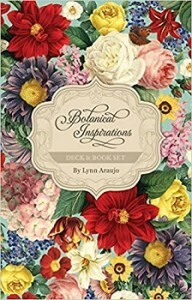 However thanks to the “Botanical Inspirations” deck by Lynn Araujo I’ll be able to enjoy the delicate flowers of spring all year round. First we have to talk about the fantastic artwork. The deck contains 44 cards featuring art by Pierre-Joseph Redoute. In Paris he did paintings of the flowers in the royal gardens. His etchings caught the eye of botanists who taught him more about plant anatomy. Redoute went on to do work for Marie Antoinette and Empress Josephine. That’s the guy whose illustrations make up this deck. Neat, right? 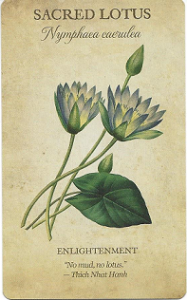 When you go to the book included with the deck, which is way more sturdy than your typical white print out style book that comes with many tarot decks, you’ll find more information about the Sacred Lotus and its “Inspirational Message”. The lotus flower grows up out of the mud, yet each day as they unfurl and shed the droplets of water, the flower emerges perfectly pristine. For this reason, the lotus symbolizes purity and spiritual transformation. With its flower so distant from its roots below the water, the lotus also represents detachment, a necessary step for spiritual enlightenment. The golden center of the lotus is rarely shown in Zen artwork since it represents the elusive perfection of wisdom. The Egyptian sun god Ra is often depicted with a blue lotus. Because of this association with the sun, the lotus signifies rebirth. Inspirational Message: Honor all the experiences that have brought you to this place on your path of spiritual growth but let go of the things that no longer serve you. Araujo offers a few variations on how to use the cards in readings, but honestly, with decks like these I prefer to do a daily single card draw in the morning to offer insight into the day ahead. “Botanical Inspirations” is a beautiful and fascinating deck that I would be hard pressed to find someone I wouldn’t recommend it to. You can learn more about “Botanical Inspirations” here. “Bowls of Happiness” (by Brian Tse and Alice Mak, and translated by Ben Wang) is wonderful little book that entertains with its whimsical art and story, and it also teaches about ancient Chinese bowls. The book is part of a series which aims to introduce children to Chinese culture at an early age. 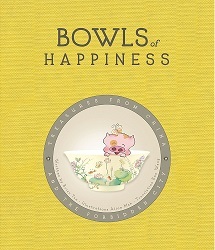 The publisher recommends “Bowls of Happiness” for children aged 4 and older. First we read a story about a mother and her daughter she affectionately calls “Piggy”. Piggy’s mom decides to create a special bowl just for her, and as she works on it Piggy enters the world being painted on the bowl. Through the story we see classic Chinese porcelain bowl designs and learn their symbolism. Once the story concludes the next section shows photos of actual bowls and talks about the intricate meanings of the images and use of color. You also learn how the bowls were made. The last thing is a bowl you can decorate yourself. Although obviously geared for children, “Bowls of Happiness” is actually a wonderful source of information for adults too. The original art is enchanting and the photos of the bowls are beautiful. 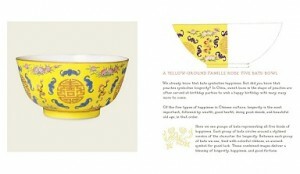 “Bowls of Happiness” is a great little book for children and adults. Let me start by saying Happy New Year! As we enter the year 2015, it is a wonderful time to intensify our exploration of dreams and their meaning. In December, we examined the influence of lunar energies on dreams and dream work. This month, I would like to explore the importance of dream journaling. While the immediate benefits of journaling might seem obvious, there are long-term benefits derived from documenting dreams as well. 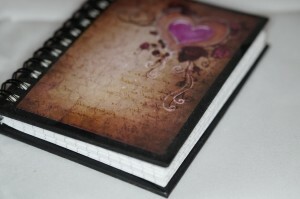 Journaling allows you to take a look back at the dreams you have had in the last few days, weeks, months, and years. Over the course of time, the analysis of your dreams can reveal the appearance of repetitious archetypes, running themes, the connections between two or more dreams, and may even hint at real life events. In order to explore this idea further, I will present you with a couple of dreams I’ve had in the past few years. The meaning of the dreams and a connection between the two is, at first, ambiguous. Yet, through analysis you’ll soon discover significant meaning behind the dreams and precisely how both narratives are connected to one another. Dream #1: About two years ago, I dreamed I was in a row boat in a vast body of water. There was no land in sight and I was all alone. The boat was slowly taking on water. I put my feet up on the seat of the row boat to keep them dry. 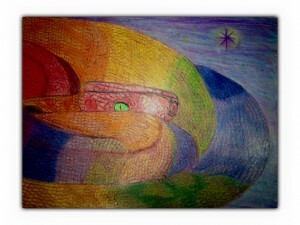 I didn’t notice the rainbow serpent curled up in the bottom of the boat until it was too late. The snake bit me. The creature was incredibly aggressive and would not let go. I was terrified as I struggled to get away from the snake. Then I awoke. Dream #2: About six months after I dreamed of the rainbow serpent, I had the following dream where I was watching a scene as if I was outside my body. I could see a mound of earth and knew I was buried beneath it. The grass on the surface of the mound was green. I was terrified at the idea of being buried alive. I could see the mound of earth moving up and down slightly, as if it was breathing. I heard a female voice speak to me. I perceived the voice to be a divine being. The voice said, “Do not worry, you’ll be fine, this is only a rebirth – a resurrection.” Then I awoke. About a year and a half after both dreams, I became incredibly ill. The illness came on suddenly and aggressively. I was at the County Fair when I became sick. While there I saw a huge rainbow in the sky. I did not know it at the time, but I had a terrible infection and my condition worsened rapidly. I ended up with sepsis and had to have emergency surgery. Following the surgery I had a lengthy and painful recovery period. While recovering in the hospital, my home was under renovation. My daughter called my husband to tell him that somehow a snake got in the kitchen and just slithered out from behind the stove onto the coffee maker (And no one was pleased to hear this news!). During recovery I had what I can only call a near death experience – there were moments I felt as if I was outside my body looking on to what was happening to me. I witnessed things that were otherwise impossible to witness given my condition at the time. Both dreams pointed toward the potential for the occurrence of a terrifying event. What is amazing about the dreams I had was the fact that I got an infection in the exact location where I was bitten by the rainbow serpent I saw in my dream scenario about a year and a half prior to the actual incident. My illness was sudden, as was the strike of the snake, and the infection was rapid and aggressive, just like the serpent. The day I fell ill I actually saw a rainbow in the sky at the County Fair. The snake appearing in the kitchen of my home was yet another strange and amazing (and extremely undesirable) connection. Before and after my surgery, there were moments where I felt outside of myself, as I did in my second dream where a female voice speaks to me and comforts me by telling me that this time period is a resurrection and I am not to worry. Indeed, my surgery saved my life and my recovery time was, without question, life-altering. What’s amazing is with some research, I found even more remarkable connections between my dream of the rainbow serpent and the divine being speaking to me. I looked up the mythological basis of the Rainbow Serpent in Aboriginal Australia. Scholars suggest a link between the serpent, the cycle of the seasons, and the incredible importance of water in supporting life (Note: In the dream I was surrounded by a body of water and the boat was taking on water. Also note that I attended the County Fair, where my illness began, during the shift of seasons from the end of summer to the early beginnings of autumn – this relates to the shift in the cycle of the seasons association of the serpent). Further research revealed that the Rainbow Serpent, because of its association with water, is considered “a giver of life.” However, the creature is also considered destructive when angry (Note: The snake struck me aggressively in the dream and the infection I ended up with was extremely destructive, destroying surrounding tissue and poisoning my bloodstream, just as if I was actually bitten by a poisonous serpent.) Remarkably, in some stories, the Rainbow Serpent has associations with blood, circulation, and the creature is considered a healer. It’s important to note that while I was surrounded by a body of “life giving water” and the row boat was taking on the same waters, I removed my feet from it. The removal of my feet ultimately signified a withdrawal from the life giving, watery associations of the serpent and the potential destruction to follow. In fact, being in a boat at all serves as a symbol of a disconnect from the life giving waters; I was not in the water in anyway, but I was physically separated from it. In some cultures, the serpent is a symbol of an umbilical cord that connects a being to Mother Earth (Note: this literally connects dream one and dream two together via the suggestion of the serpent being a connection to the Mother Earth or female deity I encountered in my second dream.) In many cultures, the Goddess is associated with serpents, with the snake proving a symbol of immortality, healing, transformation, and fertility. The venom of a snake is thought to have a fiery-like quality – it can therefore serve as a symbol of will, strength, and a purification through a trial by fire. Even more remarkably, in a synchronistic event, a few days after researching the Rainbow Serpent’s meaning in various cultures and its connection to the Earth Goddess, I casually encountered a news article while browsing on the web. The article told of the recent discovery of a Goddess statue formerly buried by the Spanish Conquistadors because it is a pagan idol. Her name is Coatilcue, meaning “She of the skirt of serpents.” A replica was made of the statue and the item was reburied (Note: the remarkable connection between the serpent dream and the live burial in the second dream where I am addressed by a female deity.) The statue was rediscovered in 1804. Considered repulsive, the item was once again buried. She has since been rediscovered and the statue is now in the National Museum of Anthropology in Mexico City. Once demonized, the statue is now viewed as a work of art. The repetitious archetypes become evident when viewing all of the related information associated with both dreams. Here, appropriate dream archetypes include all images of the Goddess/Divine Beings, serpents, and Medusa, The Magician, The Healer/Wounded Healer, and The Prophet and Mystic are all appropriate dream archetypes to examine. Looking at the following Tarot cards can also provide insightful information: The Magician, The High Priestess, Strength, Death, and the meaning behind Swords, and Pentacles. Dream journaling gives you the opportunity to document the dreams you have for further exploration. You can look to dreams for meaning you can extrapolate and use immediately, and you can use your journal to examine the potential long-term connections you might identify. Had I not documented both dreams, I might not have remembered the details of each dream with such incredible detail and I could have overlooked the connection between the two dream scenarios. Over the course of time, your journal can point to running themes, important dream associations, and potential dream connections that will prove more insightful than you ever imagined. Dayna Winters is a solitary Witch, author, and artist. She is the co-author of three books written with Patricia Gardner and Angela Kaufman including, “Wicca: What’s The Real Deal? Breaking Through the Misconceptions,” “Sacred Objects, Sacred Space: Everyday Tools for The Modern Day Witch,” and “The Esoteric Dream Book: Mastering the Magickal Symbolism of the Subconscious Mind”, all of which are published by Schiffer Publishing. You can find out more about Dayna and her work at her blog: http://daynawinters.blogspot.com/. In October we examined the symbolism of house/home structures when such imagery appears in dreams. This month, I’m focusing on how to interpret dream fragments. I’ve often heard someone say, “I don’t remember much about the dreams I have, and of what I do remember, nothing makes sense.” Then, the individual recounts one or two images that seem meaningless. These small dream pieces are fragments of a larger dream or the images might be brief and fleeting visions. What’s important to remember is that even many small remembrances can provide you with plenty of symbolism, all of which you can analyze and use to improve your life physically, mentally, and/or spiritually. Let’s take a look at how to interpret dream fragments to see just how much insight these symbols can provide. As an example, let’s imagine you have awoken from a long night’s rest only to remember the brief appearance of autumn leaves blowing in the wind. Believe it or not, such a remembrance hosts a wealth of symbolism. If you were to reflect or meditate on the image of the leaves you saw, you might realize an even deeper layer of meaning. The image of leaves on the wind can represent so many things, and what the vision represents for one person may prove to hold a completely different meaning for another. Let’s break down some of the potential meanings to explore this idea in greater depth. Color: If you remember the color of the leaves you see, you can dig even further into dream symbolism. 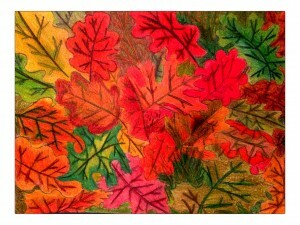 Let’s imagine for this example you see red, orange, and yellow autumn leaves. Red is a color of strength, personal power, and the life force. Sometimes in certain situations, it can represent danger. Orange is a color of attraction. Yellow is a color signifying communication, but in some situations, it can indicate anxiety. What’s more, color symbolism can change when viewed through the lens of different cultural understandings. With the latter color symbolism under consideration, ask yourself, “are you attracting danger in your life or are you perhaps attracting things that empower your personal will and strength? Are you communicating effectively or is something causing you anxiety? Further dream analysis may clarify your questions. Environment: Autumn signifies seasonal changes, cycles, and transitions. The season hints at the future dark and cold coming of winter, but its yearly return promises a future life cycle as well. The season signifies death, but the potential of rebirth. Thus, your dream might be telling you about events in your waking life relating to endings and new beginnings, cyclical changes, “a coming of age,” or a time of final harvest, whether it is literal or figurative. The environment of the dream can reveal much. Was the sky clear? Was there a storm brewing? Were the autumn leaves blowing in the wind while out of the appropriate season – for instance, was it snowing as well? All of the latter conditions can be interpreted in different ways. What about the direction of the wind? Are the leaves moving about in all directions or one? Is the movement East, South, West, or North? If moving about everywhere, the direction might signify chaos or chaotic energies. If moving in a specific cardinal direction, you might discover additional meaning. Leaves blowing East might signify new situations, conditions, or new beginnings stemming from the conclusion of something else. If the leaves are blowing in the direction of North, it can symbolize a need to ground or to turn inward to tap into your personal power. If the leaves are blowing South, it suggests the direction of the Fire element therefore connoting purification, personal will, ambition, drive, inspiration, and the spark of life. When the leaves are blowing West, it might signify the realm of emotion, the deep subconscious, or the world of spirit. Cardinal directions are also representative of seasons, and could signify a movement from one season to another. East is spring, South is summer, West is autumn, and North is winter. Thus, the dream might hint at the movement of a condition/situation/event from autumn to spring, summer, next autumn, or winter. Emotion: Consider what emotions the images evoke. Did you feel a sense of peace or happiness? Were you calm or apprehensive? Did the leaves evoke memories, either fond or undesirable? Also note how you felt upon waking. Sometimes dreams produce lingering emotions you carry with you throughout the day. Make a note of your emotions and compare your feelings with those you might be having in certain waking life situations/conditions/events, or relationships. Do you see any potential correlation? Language: Occasionally dream symbols are a play on words – the images may point to sayings, cliches, or idioms you know. For instance, perhaps your dream of leaves is telling you it is “time to turn a new leaf,” or is a situation about to “leaf out” for you by expanding and “budding?” Perhaps you are in a situation where you should leave, “no leaf unturned,” or are you behaving like another in such a way that it is like you are “taking a leaf out of someone else’s book?” Consider some of the sayings you are familiar with when you are assessing your dream imagery. Themes: As you review the dream symbols, you might note a running theme. For example, if the leaves in the wind were yellow and spinning around chaotically, you’ll see a commonality in symbols. The wind and yellow are both symbols associated with the element of Air and are therefore connected to the cardinal direction of East, new beginnings, individuality, communication (particularly through sound.) As mentioned earlier, leaves are representative of individuality, but so is the chaotic dispersing of the leaves – the leaves are separated, moving to and fro in an individual way in different directions. Thus, you can see a running theme of communication, individuality, expression, and differences. Synchronicity: Sometimes dreams are a part of synchronistic occurrences. Synchronicity refers to two or more events that appear connected, related, and meaningful, without an identifiable causal connection: events that seem like more than mere coincidence. For instance, when I began writing this article I knew I would use leaf imagery to explore dream meaning. I came up with the title: “Leaves in the Wind,” after I thought about the image of autumn leaves and windy days. A few days later I encountered one of the myths about the Sibyl in ancient Greece. The story tells of a woman/priestess with prophetic powers, the Cumaean Sibyl, who lived in a cave. She would prophesize people’s fates and document them on oak leaves. The leaves were placed within her cave near the entrance. The Sibyl’s votaries would consult the leaves to prophesize the fate of each individual. Here is where the strange synchronicity comes into play: if a wind blew through the entrance of the cave and dispersed the oak leaves everywhere, scattering them on the wind, the Sibyl would lend no assistance in bringing the original prophetic messages back together again – fantastically, I had no prior knowledge of the latter story when I created the title for this article! I have given the latter example so you can do the same when you are reviewing dream imagery. If you see leaves in the wind in your dream, pay attention to what goes on, not just in future dreams, but your everyday surroundings. You might encounter leaves actually blowing in the wind, or you could encounter the imagery in myriad ways in your waking life. I absolutely love synchronistic events. I believe they are “sign posts,” telling us to pay attention, that we are on the right path, and that we are where we are meant to be in our lives. Synchronistic events can also serve as confirmation of a higher power and the role it plays in our lives – a subtle reminder that the Universe is responding to your heightened awareness. Indeed, the more you pay attention to synchronistic events, the more such events occur. Leaf Types: The type of leaves you see will give you an indication about the archetype associated with your dream images. Let’s look at a few examples. As we have already mentioned, oak leaves are representative of the Sibyl, but they are also representative of the Oak King. Which archetype is correct? Only you will know by how you connect with the archetype you choose. Perhaps you have an affinity for the Oak King or you feel a deep connection with the archetype of the Sibyl. Your feelings will point the way to choosing the right archetype to examine further. Since anything can happen in dreams, what if you saw mistletoe leaves? Or grape leaves? Or Laurel leaves? Mistletoe might represent Christmas for one person and the Holly King for another. Grape leaves might suggest an archetype of Bacchus or Dionysus. Laurel leaves might be representative of Apollo. The images you connect with personally when you think of the leaves you have seen are the appropriate symbols for you to consider – there are no wrong or right answers when making symbolic connections. What parts of the dream fragment do I remember? In the example of leaves, what type did you see? Can you identify specific elements of the image that will give you more clarity on dream symbolism? How does the dream make you feel? Have I experienced events in the recent past that relate to the imagery? Are there any archetypes relating to the images I’ve seen? If so, what do the archetypes symbolize? Note if any of your future dreams feature similar imagery. How is it the same? How are the images different? Keep an eye out for synchronistic events. What do the seemingly connected events mean to you? And no, I do not mean animated as in part of an animated movie. I mean, Disney has a special wedding package for folks getting married at the enchanted castle (Disney World, mind you), and it includes a cake that they project various animations on top of. It looks like the cake itself is showing short little movies. It has all the links, illustrations, and how-to’s you could ask for and more. Just be sure to read, and prep, all this stuff before the actual End of the World. Words you didn’t think would go together, right? Well, engineers can be crazy, and what happens when you put science and crazy together? Mad science. Or I guess, mad engineering. Ever wonder what happened to all the photos the Soviets took with all the space probes they got into space? Well, someone else did, too, and they went out and collected them into one handy web page. Plus digital remastering. Want to see the surface of Venus? Check out this gallery of photos from BrickCon, the largest LEGOs con around. So some kooky scientists realized that the they could “build” a cosmic ray detector using an app on cell phones. Ok, not exactly a “force field”, and more like a “field of forced air”. Picture carrying around a very special fan, which blows a field of air around you to not only keep the rain off your head, but also the rest of you. Yeah, so, we’ll be seeing more and more of these crazy devices in virtual spaces. No, not a giant machine that actually makes islands (although that’s only a matter of time), but a web-based program that creates maps randomly. Useful if you’re building a world and need a few islands pronto. Apparently it’s all about the Minecraft this month. Take a virtual tour of a city that took 2 years to build. It has 96 buildings, and the creator plans even more. These are full-sized skyscrapers, people, not some kind of model, they’re functional. 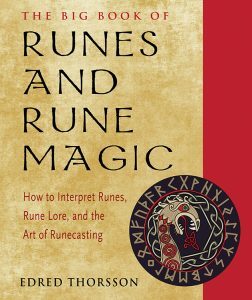 Speaking of tools to generate things, here’s a website with a way to come up with names (in varieties like dwarf, Drow, orc, arabic), treasure, magic items, Giant’s bags, calendars, baubles, cities, and spell books. Enjoy!